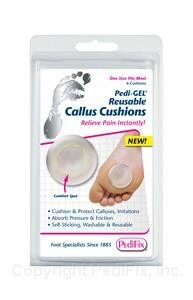 Pedi-GEL® Reusable Callus Cushions comfort and protect to relieve pain from calluses and friction and to aid high pressure areas. They feature a “comfort spot” to prevent irritation and callus build-up Self-sticking pads adhere directly to feet or the inside of shoes. 6 per pack.